Another Italian young talent is growing up. And very fast. 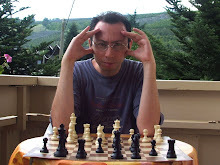 Marco Codenotti has just beaten IM Zivojin Ljubisavljevic (rating: 2279) in the 2007 Elba Island Festival (Italy), which will finish on May 13. If you think this is not an extraordinary achievement for a young boy, well, consider that Marco is only ten years old (he was born on March 1997) and started playing chess just a couple of years ago! In a long interview (by Diego Sartorio) published on the April issue of “Torre & Cavallo – Scacco!”, Marco tells he has been living in Chicago for three years (from 2002 to 2005): two or three months before coming back to Italy, he took part in a scholastic chess tournament, scoring a good result, and after that he has never stopped playing. A questionable choice. White gives away his bishops pair and has nothing in return. The simple 7.Nc3 was a better alternative. 9.e4 looks a bit more precise: after 9...Bd7 10.e5 Nh5 the position would have been about equal. Now Black takes the initiative. Another poor move: 10.h4 h5 11.g5 Nd7 12.Nh3 (12.Nxd5 Qa5+ 13.Nc3 e5 with a strong initiative in return for the pawn.) 12...e6 13.Nf4 Bf5 would have been a better choice for White. Obviously 11.Nxd5 e6 12.Nc3 Qxg5 is good for Black. White pieces have no coordination, while Black has a strong initiative. After 16.Qd2 Nb6 Black is simply better. Black can also play 17...0–0 and 17...Qxc3. A bad mistake. White had to play the "awful" 22.Ke1: after 22...Rxa2 23.Rxa2 Qb1+ 24.Kf2 Qxa2+ 25.Kg3 Nf8 26.g6 Qc2 Black still has some winning chances, but White has a very good counterplay on the King side and can fight for a draw. 22...g6 23.Rh4 Qxg5+ 24.Rg4 Qf6 25.Qh6?! 25...e5! was an even stronger alternative: after 26.Nxd5 Qd6 27.e4 exd4+ 28.Qf4 Qxf4+ 29.Rxf4 d3-+ the endgame is simply won for Black. The wrong square. 26.Qh1 was almost the only chance for White; after 26...Nf6 (26...Rc6!?) 27.Rg5 Qa3 28.Re5 0–0 29.Nxe6 Rf7 the endgame is much better for Black, anyway. After 27.Qh6 e5-+ you can see the note at move 25. 28...h4+ 29.Qxh4 Rxh4 30.Rxh4 Rg2+! White is just kidding: his position is desperate and he should resign immediately. White played really terrible, don't you think?!? What was he trying to prove??!? All those weird pawn moves in the opening....weaking his whole position. Yes, probably this is not the best game ever played by Ljubisavljevic, but the point is that Black is a 10 years old boy: and he punished in a very convincing way all bad moves made by his opponent! Thank you so much for posting this. Marco attended William H. Ray Elementary School in Chicago and was a member of our chess club. I remember that first tournament well -- the 2005 Chicago Public School championship -- because Marco had just joined the club and we had no idea what to expect from him. Though it was his first tournament, he finished among the top players in the K-3 division. 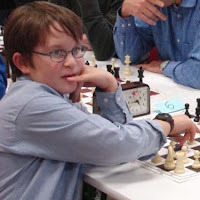 He spent nine weeks in chess camp that summer and, unfortunately for us at Ray, then took his newly honed chess skills back to Italy, where he has made incedible progress in the past two years.